The Celestron CPC Deluxe 800 HD Computerised Cassegrain Telescope will reveal the night sky how it has never been seen before - in High Definition. 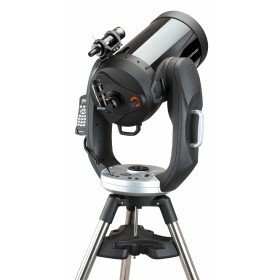 Featuring the new EdgeHD optics for exceptional image clarity and a flat focal plane that allows stars to be pinpointed right to the edge of the field of view, the Celestron CPC Deluxe 800 HD Computerised Cassegrain Telescope produces exceptional detail that can not be rivalled. With a massive 8" aperture, deep space nebulae and galaxies will look amazing. Simply attach a camera and be ready to take some amazing photos! 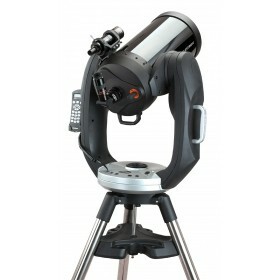 Mounted on a computerised Dual-Fork altazimuth mount for impressive stability, the Celestron CPC Deluxe 800 HD Computerised Cassegrain Telescope features a high weight threshold for the attachment of additional scopes or cameras without affecting tracking. Boasting a 40,000 object database and an easy to navigate menu system, a simple press of a button is all it takes to find something of interest to view. The built-in GPS makes for a fast setup procedure by auto-filling the date, time, latitute and Longitude readings during the setup procedure. 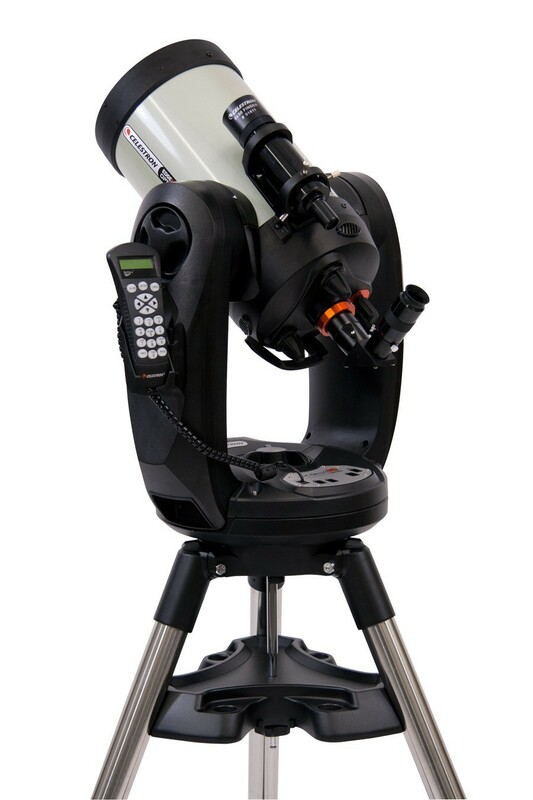 The Celestron CPC Deluxe 800 HD Computerised Cassegrain Telescope is perfect for beginners and enthusiasts alike. 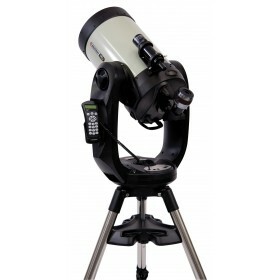 This telescope is ideal for deep space viewing, planetary detail, star clusers and nebulae. Celestron was founded by Tom Johnson whose first telescope design was a simple 6-inch reflector, built for his young son. He gradually progressed to making larger scopes in more sophisticated designs. Today, the Celestron company is an industry leader in designing and manufacturing optical equipment including telescopes (computerised and non-computerised), binoculars, spotting scopes and its accompanying accessories. Celestron's legacy spans 50 years, and has grown to enjoy recognition from amateurs to serious astronomers globally. The company seeks to remain innovative by growing its product offerings, while supporting science education around the world. Before deciding on this telescope I visited every web site I could. I researched many different telescopes, brand names, aperture sizes, tripod types, and just about everything else before deciding which features I wanted in a telescope best suited me. There is so much out there that it took me nearly a year of part-time research before I narrowed the field. Refractors, reflectors, Schmitt-Cassegrains, you name it. There are some beautiful instruments out there, all would be fantastic acquisitions. I learned a lot about all of them. In some ways the length of time was a good thing because it gave me more time to save a few extra dollars every week as I realised the price range of the professional telescope (no matter which one I chose) was going to be a little higher than I initially expected. In the end it was simple. I was after a reliable instrument that would enable excellent detailed viewing of the moon and planets, the ability to find and view deep sky objects, be easily extended to astro-photography when I decide to take on that future challenge and still be portable enough and small enough to setup in the confined space of my 1st floor balcony in the inner city. And of course, whilst most of my viewing would be from home, in light polluted skies, I wanted to be able to pack the scope into the back of my small car on the rare occasions that I ventured out to a dark site. After much thinking, I decided on an SCT (which addressed the size criteria) and settled on the 8 inch aperture to ensure I had the portability (lighter weight) I wanted. A dual fork arm Altazimuth mount would be fine. 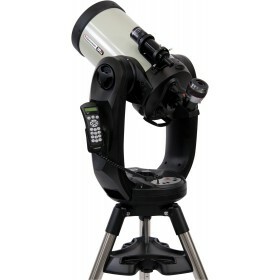 When it came to making the decision, I decided the ideal telescope that would meet my needs was the Celestron CPC Deluxe 800 HD Computerised Cassegrain Telescope. And I decided that Optics Central, with their great reputation for customer service, was the retailer to buy it from. It was a lot of money to spend on a telescope, but it has been worth it and there are no regrets with either selecting the telescope or the retailer. Both have proven to be excellent choices. I was so excited when the boxes arrived. I had already pre-read the assembly instructions, in fact Celestron’s web site has so many different manuals available to download, you can pre-read just about every aspect and learn it all in advance of its arrival. Within an hour I had the telescope assembled and ready to use. In addition to the telescope, I ordered several accessories too, including the Power Tank 17 amp-hour power supply, Vibration Suppression Pads, Lens Shade, UHC/LPR Filter, 2" Eyepiece and Filter Kit, Baader Planetarium Hyperion 8mm-24mm Clickstop Zoom Eyepiece, Orion Solar Filter - 8" SCT and most important of all the Feather touch SCT Dual Speed Micro Focuser for Celestron CPC-800 Schmidt-Cassegrain Telescopes. In my research I knew one key criticism of this particular telescope was the lack of granularity when focussing. So I ordered the Feather touch micro focuser from Starizona (US) and it was ready when the telescope arrived. Watching the videos available on You Tube meant that installing was easily done within half an hour. I kept in contact with Optics Central (Cassie was great) and they helped me out with hints or help every time. And then I had to wait. And wait. And wait. Nearly 8 evenings later, when the clouds over Melbourne had finally sufficiently dispersed (it wasn’t cloudless but it was good enough), I rushed the telescope out to my balcony for my first viewing. It only took a couple of minutes to assemble, another minute to “align” (which was pretty straight-forward) and the views were sensational. I was stunned. My kids were stunned. We took it in turns to decide which object to “go to”, plugged the information into the computer and away it went. Almost every object was in the very middle of the field of view, or if it wasn’t, it was close enough and only a tiny adjustment was needed. The stars, double stars, open clusters, globular clusters were all so crystal clear. The Wild Duck cluster (M11 or NGC 6705), the Butterfly cluster (M6 or NGC 6405), the Jewel Box (NGC 4755) I could resolve objects that I could never resolve before. Fine details were easily noticeable. It helped that my first night with my new telescope was a great viewing evening. The kids loved it and I loved it. Since then, there have been nights when the viewing has been poor, on those occasions I still love seeing my favourite planets and just watching them in their beautiful detail through my wonderful telescope. Saturn is everyone’s favourite, and mine too. Trying at different magnifications from 50X thru to 400X makes different details available. The Cassini division in Saturn’s rings, different craters and riles on the Moon, even Mars’ poles. It is all wonderful and I can’t wait to move on to astro photography with this telescope as I’d like to see those “grey smudges” (galaxies, nebulae) in their glorious colour one day soon. It’s “Fastar Versatile” so I can’t wait. Before deciding on this telescope I visited every web site I could. I researched many different telescopes, brand names, aperture sizes, tripod types, and just about everything else before deciding which features I wanted in a telescope that best suited me. There is so much out there that it took me nearly a year of part-time research before I narrowed the field. Refractors, reflectors, Schmitt-Cassegrains, you name it. There are some beautiful instruments out there, all would be fantastic acquisitions. I learned a lot about all of them. In some ways the length of time was a good thing because it gave me more time to save a few extra dollars every week as I realised the price range of the professional telescope that I was after (no matter which one I chose) was going to be a little higher than I initially expected. Scratch & Dent / Misc. Get exclusive offers and be the first to know about our sales! 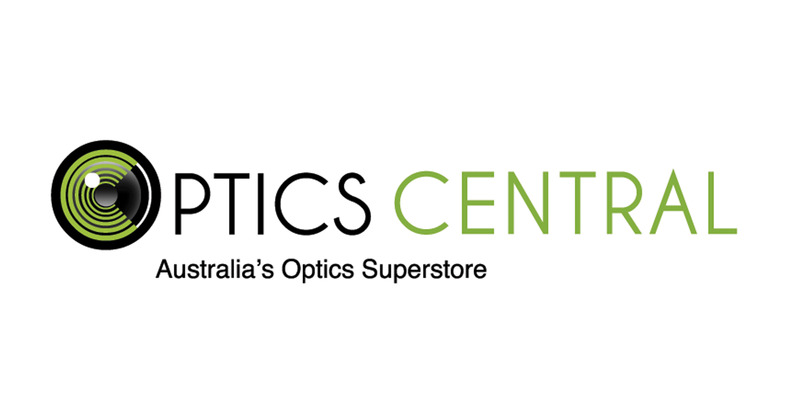 OpticsCentral is able to Price Match some Australian retailers on telescopes and sports optics (we can NOT price match cameras and accessories). As a part of our Price Match policy, we hope to be able to provide the best price we can for our customers without undercutting ourselves. We try to provide competitive pricing when possible, but cannot always guarantee the best price. We make up for any discrepancy in price differences by aiming to provide superior customer service! We WILL provide a price match if we can! Please note this is a price match Policy and not a price match Guarantee. We make no promises on matching any competitor prices. Customer must contact a customer service representative with either a written quote or link to competitors website / catalogue currently offering the price. Also find out any shipping costs which apply, and make sure the product is definitely in stock with the competitor. Check that the competitor is carrying Australian products. A list of suppliers we can price match can be found below. If in doubt, contact our supplier and find out if they supply the competitor with that particular product. Check our costing. The competitor may have leftover promotional stock that we can not price match. If our cost price is too high, we will not be able to match them in price. At OpticsCentral, we want you to be happy with your purchase! If you have any problems with your order within 30 days of purchase, we are happy to help you out with an Exchange or Refund. No problem! If you would like to return an item to us for an Exchange or Refund, we are happy to do so within 30 days of purchase as long as the item is in its original condition with all of the original packaging. Simply contact our Customer Service team via the Contact Us page or call us on 1300 884 763 and we will issue you with a Return Authority for your product. Please note that return shipping is at the expense of the customer and Refunds will exclude the original shipping fees. *Unfortunately, we are unable to accept Change of Mind returns on Telescopes unless the packaging has not been opened. It’s unfortunate, but sometimes products may have a manufacturing fault or get damaged in transit. Sometimes packaging errors can occur - we are human afterall! If you have any issues with your order, please contact our Customer Service team via the Contact Us page or call us on 1300 884 763 within 30 days of receiving your order and we will issue you with a Return Authority for your product. Once assessed by our team and the item is found faulty or we have made a mistake, we are certainly happy to provide you with an Exchange or Refund. Return shipping for Faulty or Incorrect products is FREE, and we will send out the replacement at no additional cost to you. Please allow 4-6 weeks for your item to be returned to us and assessed. Refunds will be made or exchanges finalised during this time.